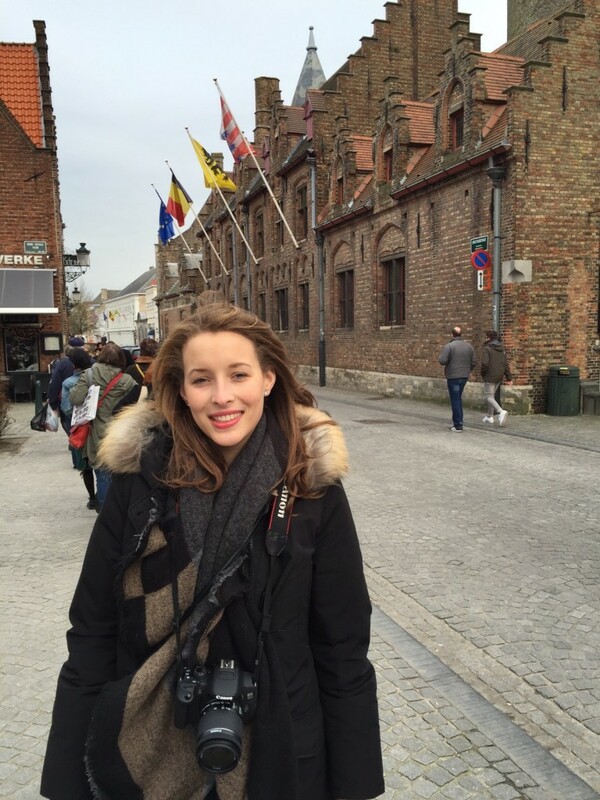 A few weekends ago I had a bit of time off and decided to finally go to Bruges! I have been dreaming about going to that beautiful city for so long that I decided it was time to take a break and go visit. 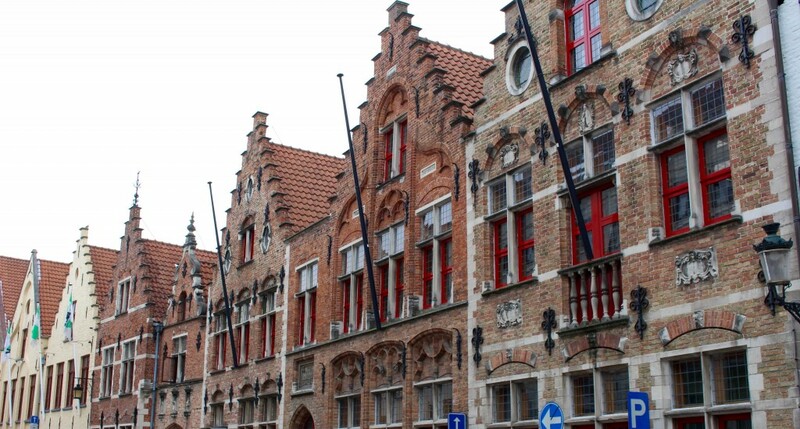 Bruges is easily accessible by car or train from Rotterdam taking approximately 2 and a half hours’ journey. If you visit by car, go to the center of the city there is a large underground parking next to the Concertgebouw or “concert building” from which you can easily walk around and access the main streets. I visited on a Sunday so beware if you plan to go shopping that shops only opened around midday! Bruges is a city in West Flanders, Belgium (North West of the country) with a beautiful historic city center which is a UNESCO World Heritage Site. 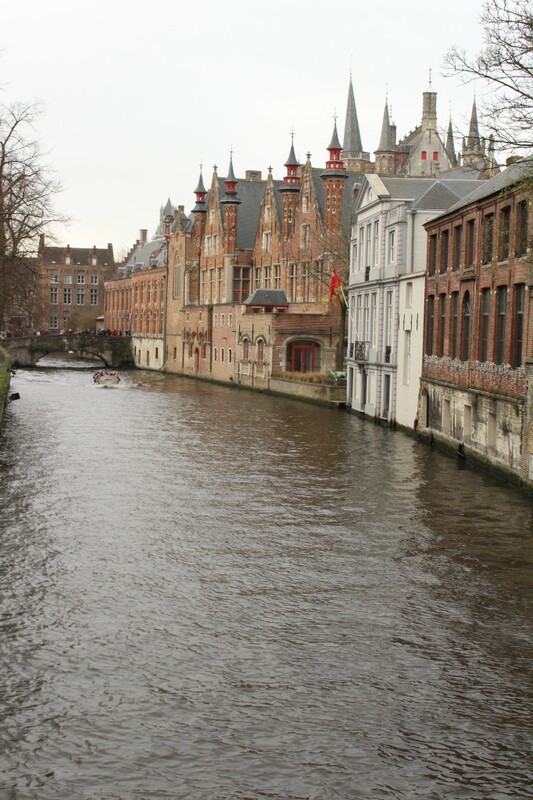 Bruges is famous for its many canals and is sometimes compared to Venice but to me they are completely different. 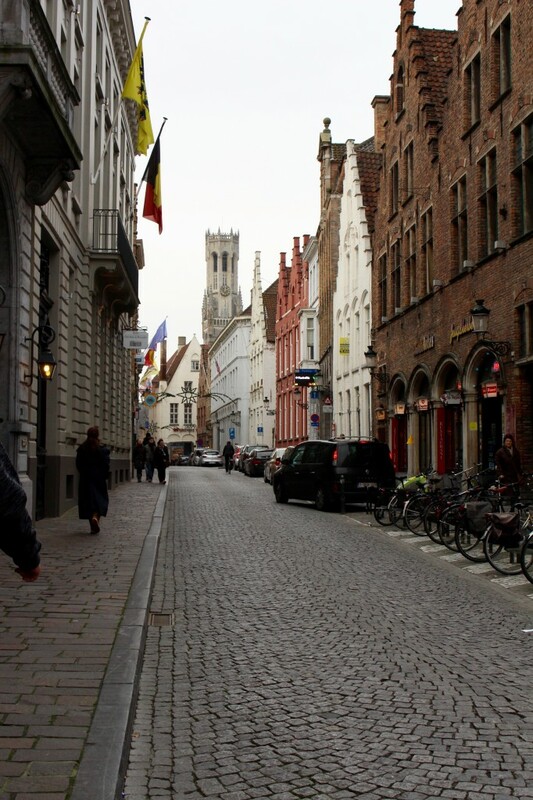 Once parked in Bruges I walked towards the main historic center and I already fell in love with this Romantic city. 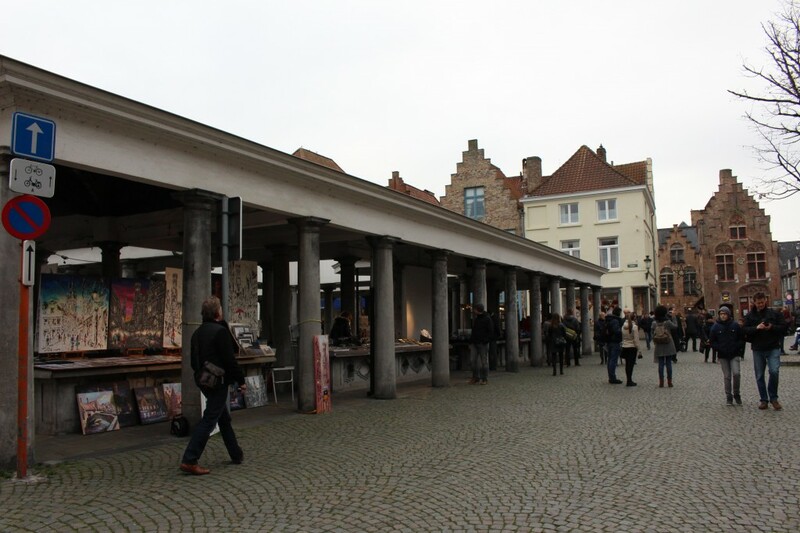 Walking past the market and onto the shopping street, I already saw the famous Belfry of Bruges in the distance. There were all kinds of shops and more chocolatier’s than I have seen in a long time, being a huge chocolate fan myself it was hard to resist walking into all of them and buying different kinds of chocolate (we all know Belgium is famous for its chocolates). Even when you are just walking around Bruges, it feels like there is always something to admire, whether it is a building, a shop, a street. After walking for several minutes I eventually reached the Grote Markt or the “Market square”. 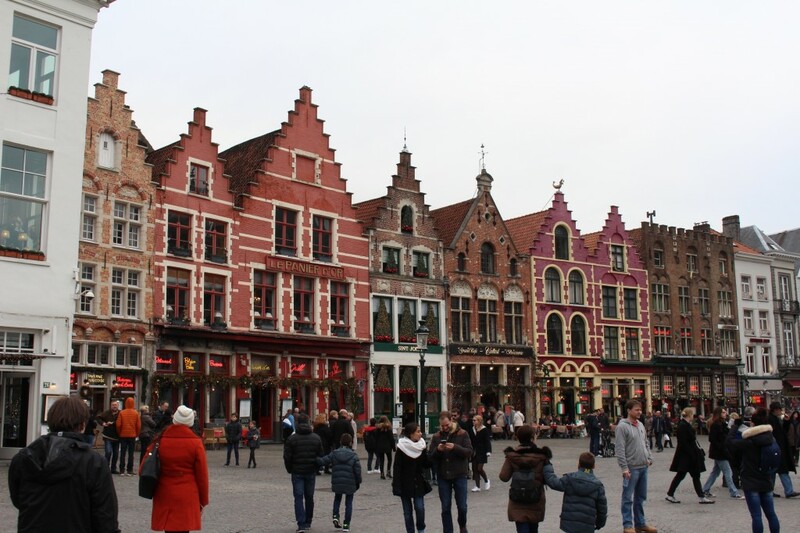 This is one of the most iconic sights in Bruges! 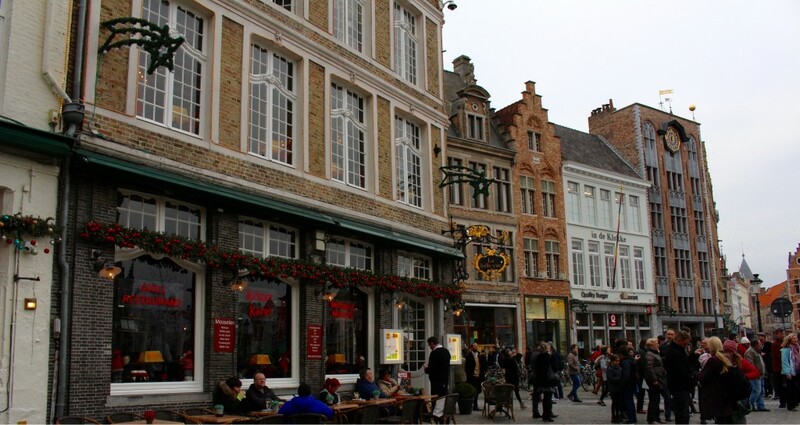 Not only are there several shops’ and café’s, it is the location of the Belfry and the provincial court as well as the beautifully colored buildings we often see in postcards. 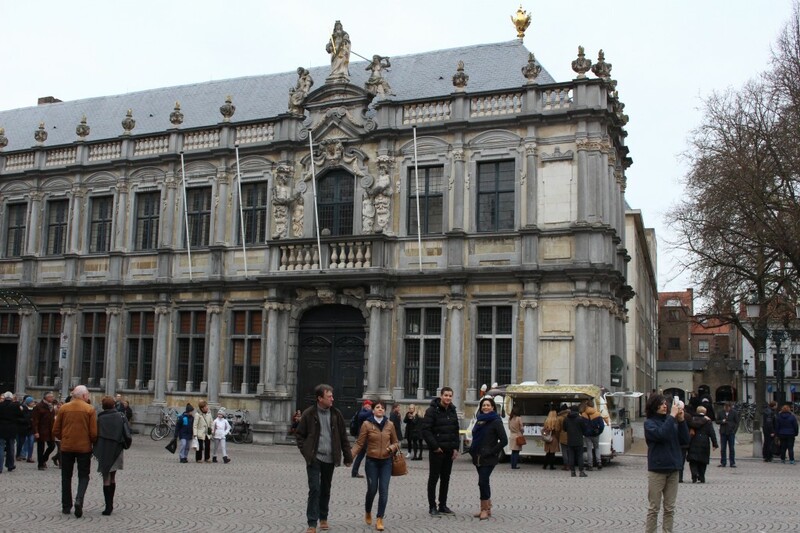 One of the buildings that stands out the most at the Markt is the Provinciaal Hof or the “Provincial Court” which looks like a old Castle but is actually a neogothical building and formerly used by the government. The building is now currently being used as a ceremonial building. The building that can be seen now is not the original which was burnt in a fire and reconstructed. 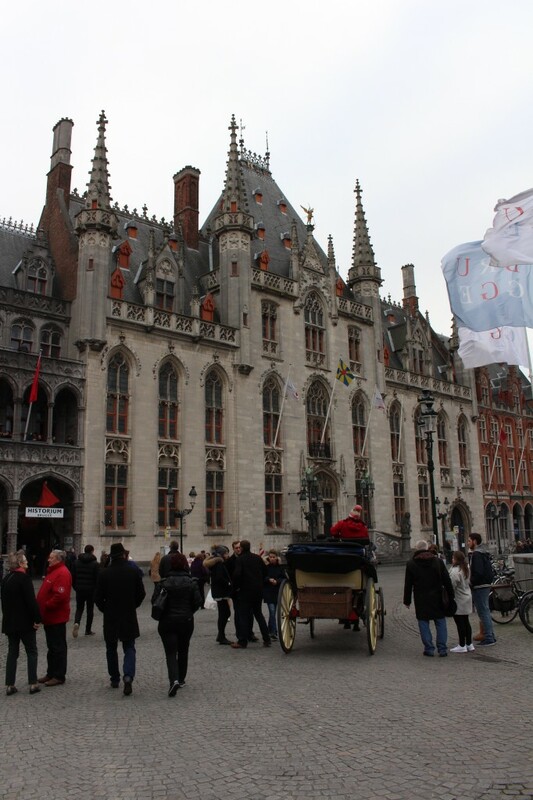 A point to add is that when in Bruges you will see many horse-drawn carriages taking people on tours of the city. If you are not a fan of walking even though I did not take this tour, it looks like a fun way to see the city and if you are with a small group, even better. Beware of them though if you are walking as they often go by quite quickly. 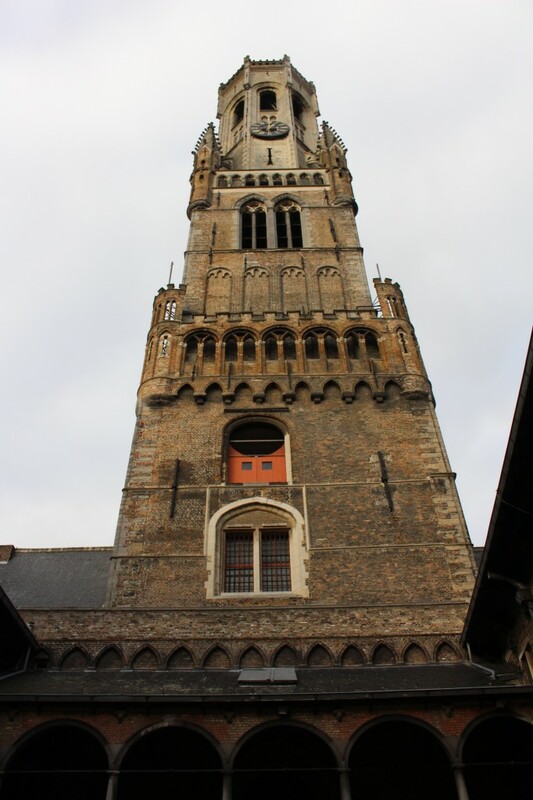 Opposite the Provincial Court is the famous Belfry of Bruges. The Belfry of Bruges (also known as the Belfort) is a medieval bell tower (83 meters high) located on the Markt and the most prominent building. The bell tower can be accessed by visitors by 366 steps and provides and has a view over the city. Formerly the building was used for the treasury and the storage of archives, and the tower to spot dangers such as fires. 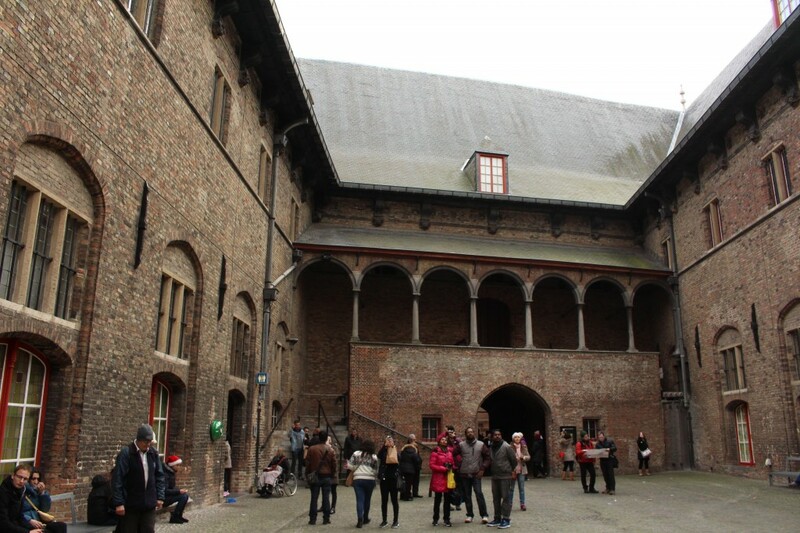 There is also an inner courtyard. The belfry was built around 1240 but was rebuilt years later after a fire although its contents (the archives) were lost forever. 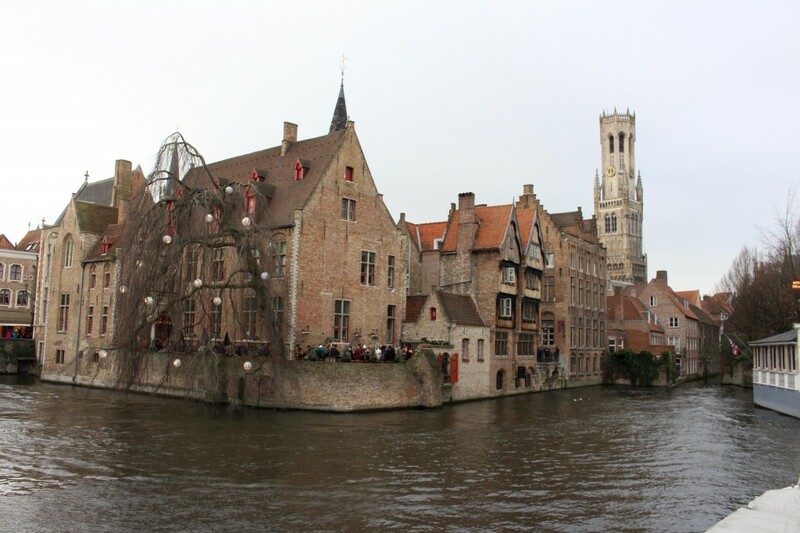 Have you seen the movie “In Bruges”? I watched it after I visited the city and the Belfry is often shown and plays an important role in the movie. 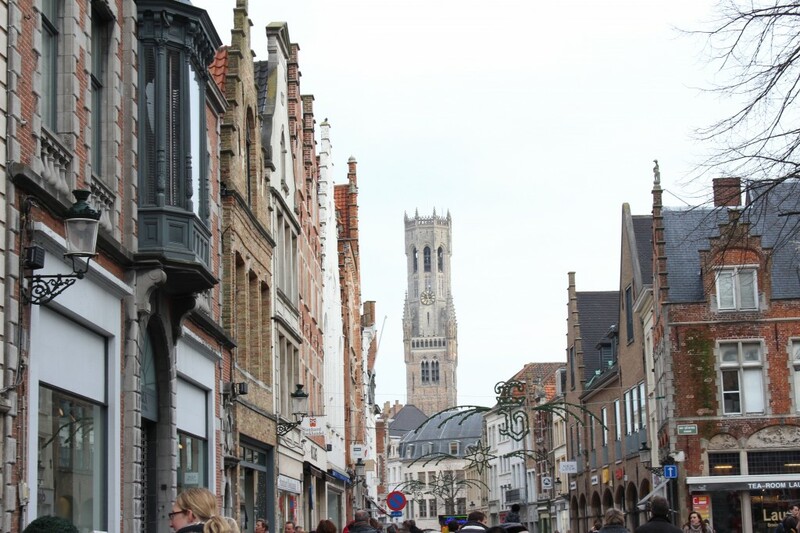 It was quite funny to see that since the movie was made, Bruges has not changed and it’s a great way to have a second look at the city. After enjoying the Markt I walked further onto the next square, Burg Square or “Castle Square”. 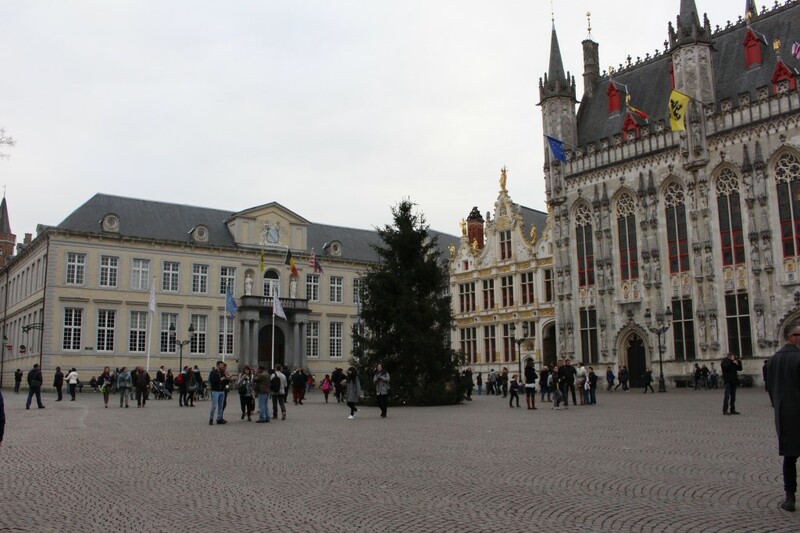 At Burg square we can find the City hall and Civil registry. Both buildings have been beautifully designed with figurines, there are some benches surrounding the swuare so make sure to sit down and enjoy the view. The City halls first floor is open to visitors. There is also the Bishop’s palace opposite the city hall. This building was built by the third Count of Flanders and assigned to the Bishop in the aftermath of the French Revolution. The last important building located on Burg square is the Basilica of the Holy Blood. This Roman Catholic Basicila was originally built in the 12th century and it housed an acclaimed relic of Holy Blood. This basilica is made up of an upper and lower chapel with the upper chapel being in Gothic style. 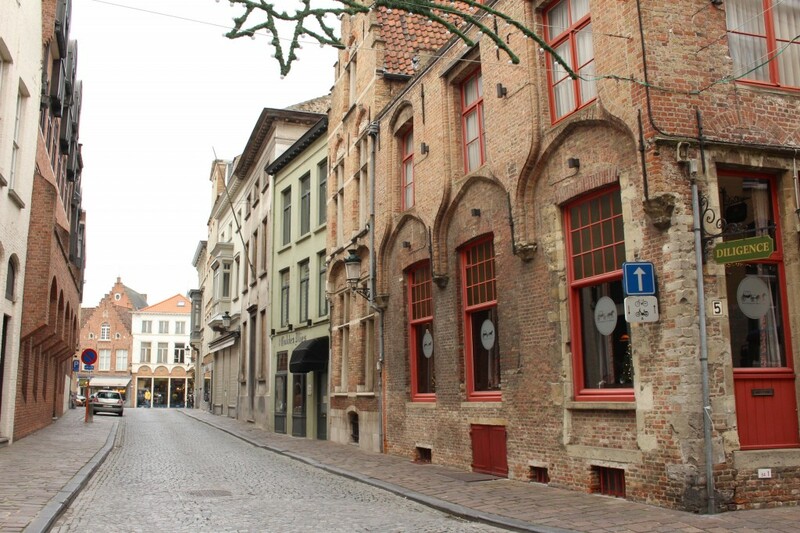 After Burg Square I walked along the Streets of Bruges, simply admiring the tranquility that can be found outside the main tourist sights. Eventually I reached a Canal with a great view of the other side of the historic buildings that were just previously mentioned. Walking along the water eventually I reached the Vismarkt or “fish Market”. 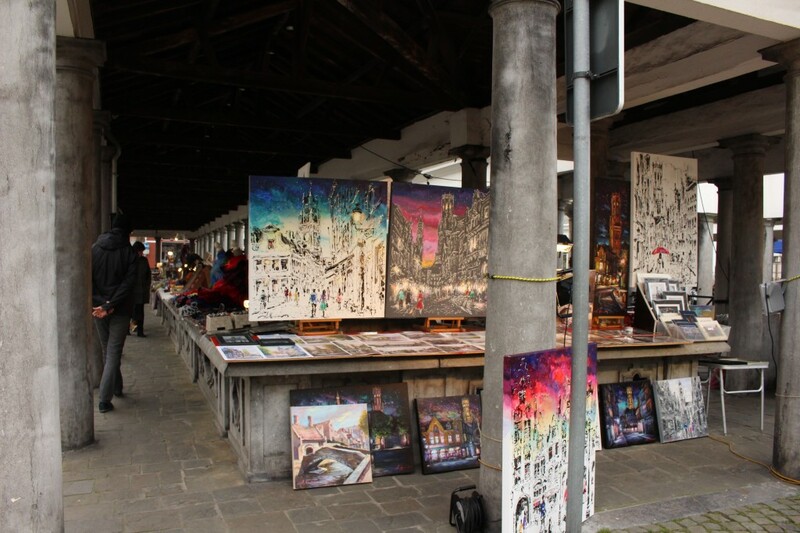 There was however no fish being sold at the market, instead there was all kinds of arts and crafts. The view of all the buildings was spectacular while walking along the water. I did not take a boat tour but it is another possibility for those who cannot or do not enjoy walking around. After walking around for a few hours I decided to stop and eat something. I ate a waffle with chocolate, you simply cannot go to Belgium without doing this! 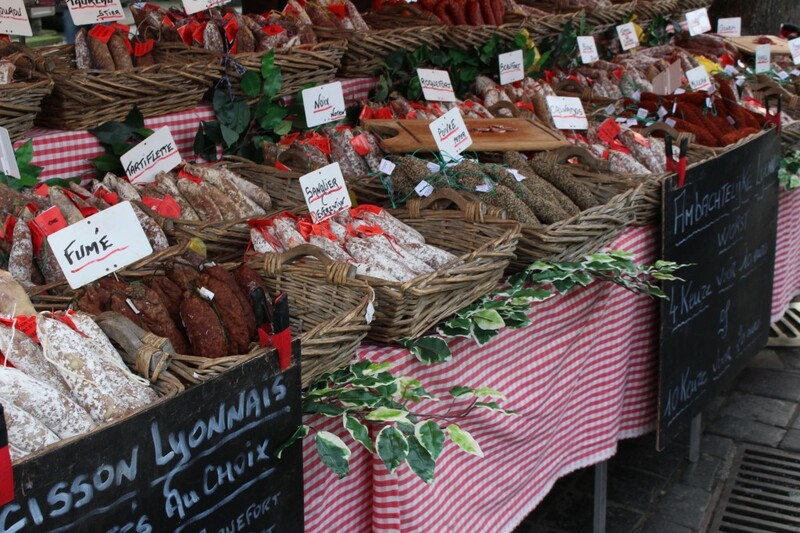 There are many café’s and shops were you can take a break from sightseeing and relax. 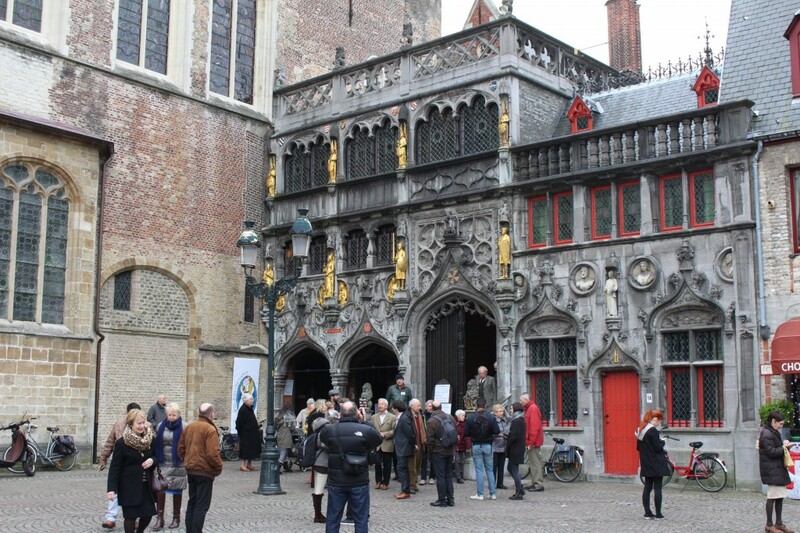 There are several more sights in Bruges that I did not get the chance to see including the Loppem Castle. This castle is located on the outskirts of Bruges and was built in the 18th century for a Baron. For those who appreciate Gothic architecture this is a sight to visit. 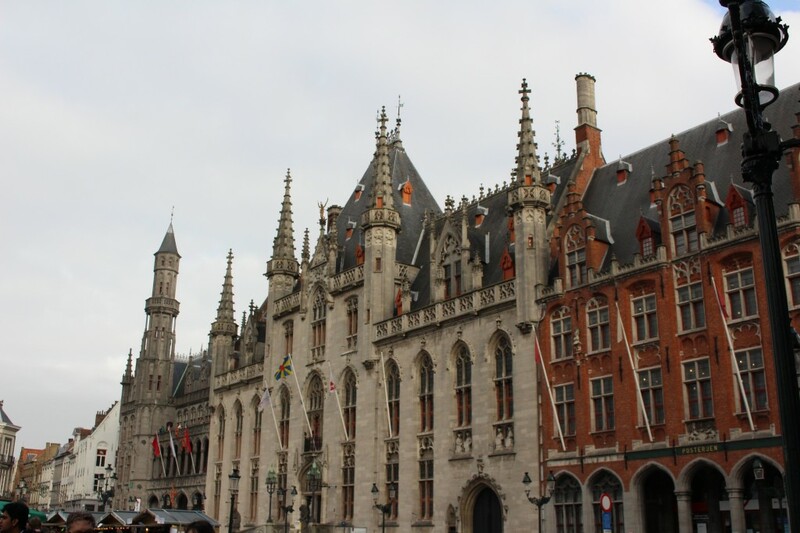 There are also more cathedrals in Bruges that can be visited such as St. Salvator’s Cathedral and the Church of our Lady of Bruges. St. Salvator’s can be seen on the walk from the Concertgebouw (the parking) to the historic center. It is a tall and prominent building. The Church of Our Lady or “Onze-LieveVrouwekerk” is the talled structure in the city dating back to the 13th Century. The church has gained its name because the tombs of a duke and his daughter are located behind the high altar. 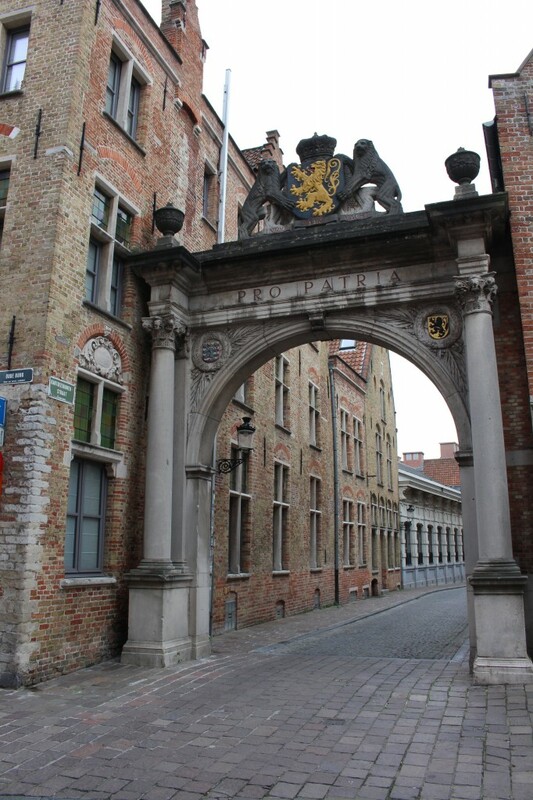 The last sight I would have liked to see but didn’t have a chance to is the Kruipoort or “Kruis gate” which is one of the last remaining gates to the city of Bruge that was constructed in the 14th Century. 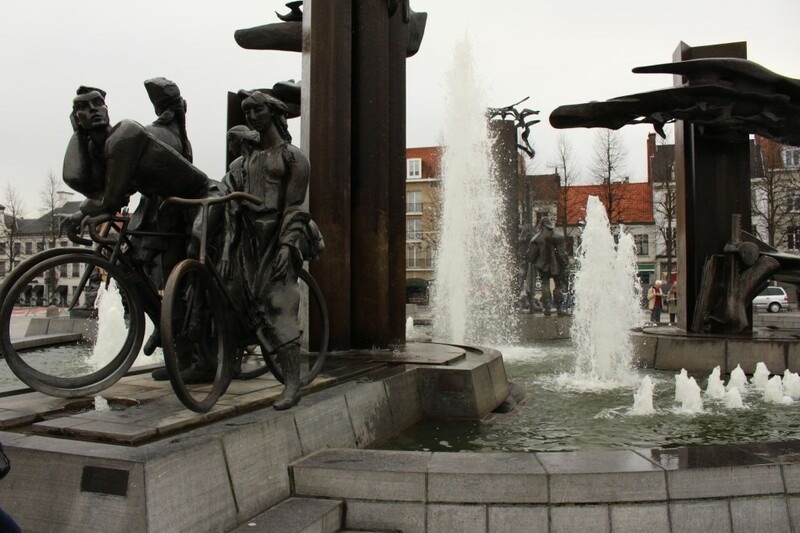 After a long day of sightseeing and chocolate I walked back towards the car and stopped at the square in front of the Concertgebouw, there is a dynamic fountain to admire and the last sight to see before heading back to the car. Tip: I left Bruges around 4pm on a Sunday and at that time there was such a big queue of people entering the city and waiting for parking spaces that I do not recommend you arrive at that time, try to make it for midday if you are planning to stay for the day in order to avoid wasting time in traffic. Tip: Take a map with you as there are many streets and if you want to see most of the sights in one day it can be tough to navigate and find your way with all the people walking around. Also make sure to check the weather before visiting because if it is raining you will not enjoy the city, It was very grey on the day I visited but at least it was not wet and already with the grey sky it was not easy taking pictures. Planning to visit Belgium, Book Luxury Hotel Now!